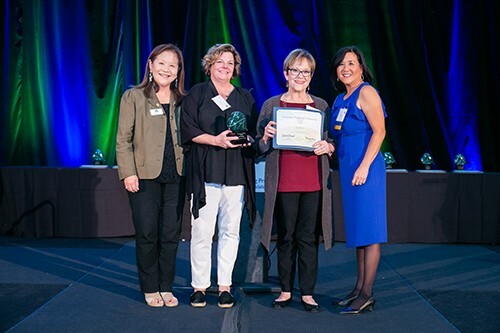 SolMateo recently received the Outstanding Philanthropic Organization award from AFP Silicon Valley, in recognition of their incredible work supporting and promoting local mental health services. SolMateo began its relationship with StarVista back in May 1999 and has been one of StarVista’s most important and enthusiastic supporters ever since. Driven entirely by a group of women volunteers, SolMateo - formerly the Community Service League (CSL) - is committed to impacting San Mateo County residents in crisis or challenged by mental health issues and has dedicated their resources, energy, and advocacy to StarVista’s Crisis Intervention and Suicide Prevention Center (CISPC) for over two decades. Your generosity this past holiday season was incredible! Your contributions will help StarVista respond to critical needs across all of our programs, including those that support youth and families who are facing homelessness, substance abuse, domestic violence, and mental health issues. Thank you! We also want to thank our amazing Gift Drive supporters. Your gifts of toys and gift cards helped brighten the holidays for over 800 children and families. We were so humbled by the outpouring of generosity that enabled us to share gifts with all clients who wanted to participate. A very special thank you to all of the volunteers who helped deliver and arrange all the packages! Your gift to StarVista supports the children, teens, and adults who are struggling in our community. Donate today and help us provide powerful interventions that change the lives of our neighbors. This email was sent to starvista@liorg.net from . If you do not want to receive this email, then please click opt-out to unsubscribe. Our mailing address is: .